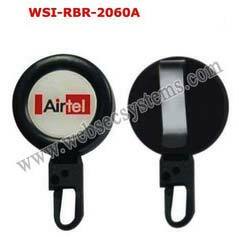 With a vast distribution network and ethical business practices, we offer retractable clips ( yo yo )-wsi-rbr-2060a. Our trolleys are manufactured using bio-degradable plastic materials sourced from leading vendors. moreover, these clips are attached with attachable metal pin at one side and space for company advertisement at the other side. These products are attracted by the people for its neat design. Applications: used by multi national companies schools and colleges offices and banks commercial executives.